What do you think of landscaping stone? Many gardens and outdoor areas have wooden steps, from back in the day, or were inherited when the houses were bought, which are left for ages and, unbelievably, we allow these steps to remain for years. Why is this common? It gets to a time that a change is needed! And that’s when stone comes in; landscaping stone is the best type of garden hardscaping, right? Better than brick, better than wood…..way, way better than plastic! And it’s just not steps we are talking about. 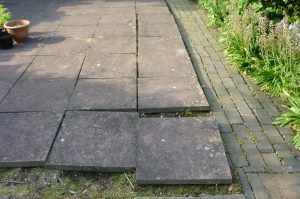 Instead of a rapidly decaying wooden patio or a cluster of unevenly spread loose concrete slabs, why not a tidy and beautiful set of Himalayan stone patio slabs for example? 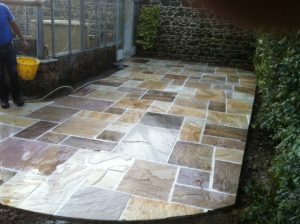 (right – Stone Patio done by us). What landscaping stone should I use? Slabs, and overall stone, will guarantee you years to come of you not worrying about rotten wood or how bad it might look, and not spending hundreds, if not thousands, of pounds to fix it up once in a while. With stone the only thing you have to do is pressure wash it a couple of times a year, maybe some pointing with years in between and you have a pretty, practical and easily maintainable stone work.